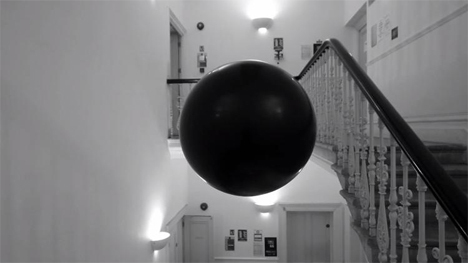 How terrifying would it be to turn around and see a levitating black balloon following your every move and repeating the last conversation you just had? 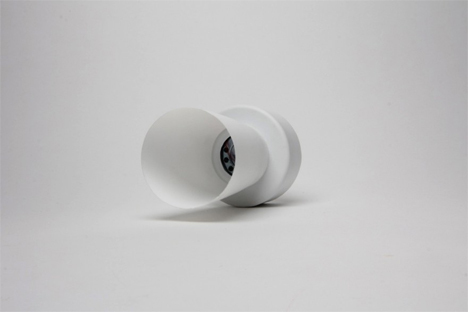 Royal College of Art student Francesco Tacchini, in collaboration with designers Julinka Ebhart, and Will Yates Johnson, created exactly that, and called it Space Replay. 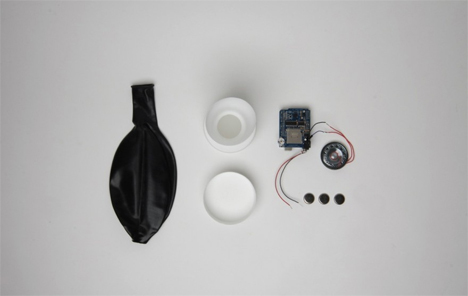 The hovering balloon is stuffed with a battery-powered Arduino, an Adafruit Wave Shield hacked to record and playback, and a speaker. The components were sealed within a plastic cone to both amplify the sound and protect the balloon from the wires and other pointy objects. A small amount of helium was added to let the balloon hover, but no so much that it would soar above people’s heads. The Adafruit Wave Shield records ambient sounds and plays them back with a short delay, turning a sort of phonic mirror on the people in the space around it. The slowly-moving sphere looks like something out of a nightmare, and the sounds that come from it aren’t particularly music to one’s ear. The designers unleashed it in public and watched as confused bystanders kept a wary eye on the balloon, unsure of just how to behave around it. It’s a little bit humor and a little bit serious, allowing us to look at ourselves and our casual conversations in a completely new light.